“26th Thursday A cloudy disagreeable day & night I did my choars was at the office all day & evening came home 8 ½ went to bed at 9 ½ nearly sick & lonely as death. “27th Friday A cloudy misty disagreeable day & snowed several inches during the night I did my choars was at the office all day & evening came home at 8 ½ & went to bed at 9 ½ tiard lonely & nearly sick dishartened and about discouraged. “28th Saturday Several inches of snow on the ground & a snowing looks conciderable like winter brooke away in forenoon a cold night & froze quite hard, I did my choars was at the office all day & evening came home about 8 & went to bed about 9 tiard lonely & sick. “29th Sunday A cold but more pleasant morning and day but froze quite hard last night I did my choars eat breckfust went to the office & back choared round the house picked some apples etc took my cold off to wean etc, a good deal like winter I went to bed about 8 ½ nearly sick dishartened & a lonely as one can be & about discouraged [in margin] a cold winterlike day. “30th Monday A cold cloudy disagreeable day I did my choars was at the office all day & evening came home at 8 & went to bed about 9 lonely & sick [in margin] Bostwick moved to Wheaton. “31st Tuesday A cold cloudy disagreeable day & night seemed like winter I did my choars was at office all day & evening & came home 8 bed 9. The Warrenville Museum Guild will be hosting the 31st Annual Christmas Fest Craft & Bake Sale on Saturday, November 7th from 9:00 a.m. – 4:00 p.m., at the Warrenville Community Baptist Church, located at 28W444 Main Street, Warrenville. This is a temporary location change due to construction in the Leone Schmidt Heritage Park. Attendees can get their holiday shopping started while supporting the Historical Society. 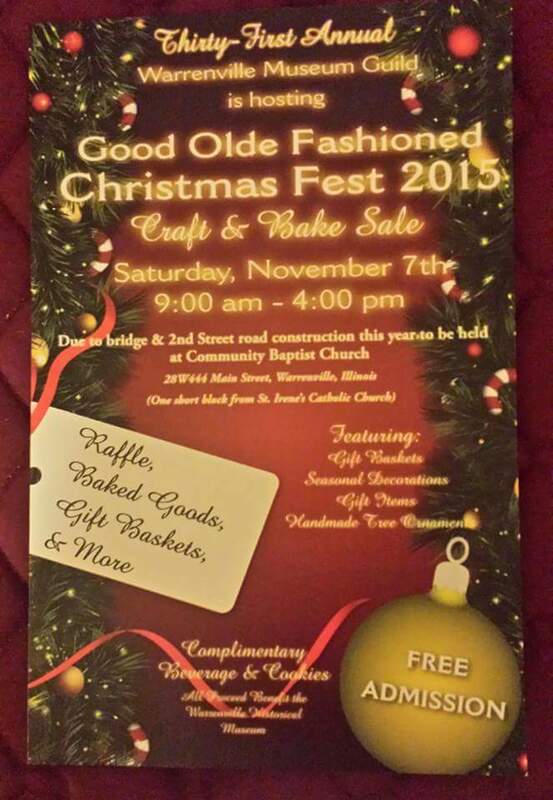 Gift baskets, seasonal decorations, gift items, handmade tree ornaments and baked goods will be available for sale. Complimentary tea, coffee, cookies and holiday music will set a festive theme. Raffle tickets will also be sold for the event and can be purchased prior to the Fest at the Museum when it reopens on November 1st or at the Baptist Church on the day of the Fest. Purchase a chance to win one of two crocheted afghans or a Fall-Thanksgiving holiday centerpiece set. Proceeds benefit the Warrenville Historical Society. Historical Society historic ornaments will also be available for purchase, including the new Roundhouse ornament, and local history books. “19th Thursday fine cool weather I did my choars was at the office all day & evening came home at 8 ½ & went to bed at 9 ½ lonely as death. “20th Friday rather a fine cool day & evening I did my choars was at the office all day came home about 8 ½ went to bed 9 ½ lonely. “21st Saturday fine weather for the season I did my choars was at the office all day & evening, a lonely day came home at 8 ½ & went to bed at 9 ½ tiard, about sick & lonely as death and dishartened. “22nd Sunday A cloudy morning with a shower last night, a fine day with some clouds and grew warm all day was quite warm at sunset I did my choars eat breckfust & went to the office & back, killed chickings & dressed them H Gould & family came & I went to James Browns & back & found Wm J. McNelly & family here we went over to the mill & store & back east supper & bought Wm McNelly colt to mate mine for $45. & they went to home between 4 & 5 it was lonely after they left I did my choars wrote some skinned some milk & washed the pans & went to bed between 8 and 9 nearly sick lonely as death, dishartened and feel about used up. “23rd Monday rained last night & this morning lowry day I did my choars was at office all day, came home at 8 & went to bed at 9 lonely [in margin] H Willson at store. “24th Tuesday A cloudy rainey disagreeable day & night I did my choars was at the office all day & evening came home at 8 ½ & went to bed at 9, tiard, lonely & sick. “12th Thursday fine weather for the season I did my choars was at the office all day & evening came home at 8 ½ and at 9 1/2. “13th Friday rather fine weather I did my choars and went to the office all day & evening came home at 8 ½ & went to bed at 9 ½ tiard lonely. “14th Saturday fine day but cloudy, I did my choars was at the office all day & evening came home at 8 ½ & went to bed at 9 ½ lonely & sick. “15th Sunday A cold pleasant morning & cold day & evening & some cloudy I did my choars went to the office & back & started at 8 ½ for McNellys with H Gould & family got there about 10 started back about 4 & got home about 6 did my choars wrote some & went to bed about 8 tiard lonely & about sick. “16th Monday rather fine weather I did my choars was at the office all day & evening came home at 8 ½ & went to bed at 9 lonely & sick. “17th Tuesday rather fine cool weather I did my choars was at the office all day & evening came home at 8 ½ went to bed 9 lonely as death. “5th Thursday rather a cool cloudy morning rather a fine day & evening I did my choars was at the office all day & evening came home about 8 ½ & went to bed about 9 ½ tiard & nearly sick, dishartened and lonely as death, Rol Willson & Caroline came to Shermans this evening at 8 or 9 oclock. “6th Friday A cool & rather cloudy day & evening & looked like rain but did not, I did my choars was at the office all day & evening, came home 8 ½ went to bed about 9 tiard and about sick dishartened & lonely as death, Rol Willson & Caroline & Walla came here from Shermans today, She stayed a short time in middle of day went back to Shermans about 4. “7th Saturday A cloudy morning but rather a fine day & evening I did my choars was at the office all day & evening came home about 9 ½ & went to bed about 10 tiard & nearly sick & as lonesome as death I shut up & stayed for T. Corlett to cut my hair [in margin] R Willson & Caroline & boy & ______ Austin went back to Coral. “8th Sunday A cloudy disagreeable day more pleasant in middle of day & warm I did my choars got my breakfast & eat it then went to office & back wrote some choared round in forenoon, went up to Sherman Willsons about one came back before night did my choars & went to bed about 9 tiard lonely & nearly sick, so lonesome it seems as if I could not stay round the house dishartened & discouraged. “9th Monday A fine cool day & evening I did my choars was at the office all day & evening came home at 8 ½ and went to bed about 9 tiard & nearly sick, dishartened & lonely as death. “10th Tuesday rather fine cool weather I did my choars was at the office all day & evening came home about 8 ½ & went to bed at 9 ½ tiard lonely & about sick. The Warrenville Historical Society is happy to announce “Dead Men Talking – And Some Women – VIII,” which will be held on Sunday, October 18, 2015. The outdoor 45 minute tours will start every 15 minutes beginning at 6:00p.m. with the last tour beginning at 7:30p.m. Tours are given on a first come first serve basis. For those not wishing to walk through the cemetery, a presentation by the interpreters will be given at 5:00p.m. in Trinity Lutheran Church. During this year’s event, leaders of Warrenville and the history of their families will be highlighted, including our community’s founder, Julius Warren; an early advocate for education, Seraph Warren Holmes; an early medical pioneer, Dr. Mary Breme; and Warrenville’s first mayor, Bill Stafford. 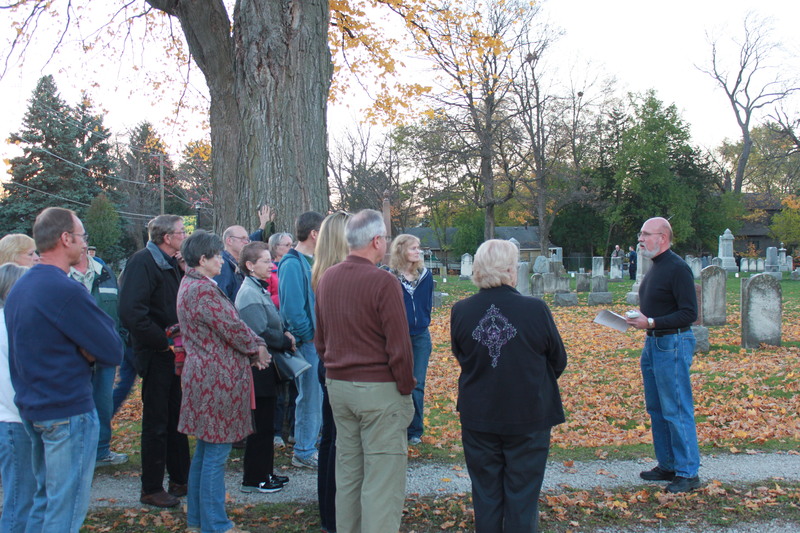 Cemetery tours begin at the Warrenville Cemetery, located on the north side of Warrenville road between Curtis and Warren. Luminaries will light the way to lantern-lit gravesites where costumed interpreters will tell the wonderful stories that brings Warrenville history back to life. Tour admission is free but donations will be accepted and are appreciated. All donations benefit the Warrenville Historical Society. Parking is available at Trinity Lutheran Church located at the N/W corner of Curtis and Warrenville Rds. Refreshments will be served at Trinity Lutheran Church after the tours. Thank you to this year’s sponsors: Chase Upholstery, Courtyard Banquets, Minuteman Press, NorthStar Credit Union and Voegtle’s Auto Service.